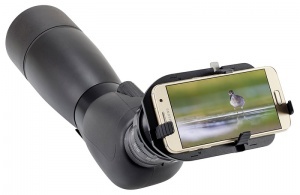 The Opticron Universal Smartphone Mount USM-2 is a simple and flexible way to connect your smartphone to Opticron SDL, HDF and HR eyepieces and shoot video or take high magnification photos. The USM-2 comprises a mounting plate with 4 adjustable clamps to hold your smartphone securely coupled to a self centring 3-pin adjustable clamp that fixes securely over your eyepiece. The USM-2 is compatible with mobile phones fitted with a single front facing camera lens and a screen size up to 6” - subject to the position of the camera lens on the device.